Here at Pool Supplies we have professional water testing facilities, which can calculate the chemical levels of your pool water in just 60 seconds. If you are experiencing problems with your pool water or you would just like us to perform a regular water analysis, then visit our shop and we will test it for you for free. If you are unable to wait around for your test results, then we will email them to you, it’s that simple. To perform a water analysis, we would need you to sterilise a container, and then fill it with your swimming pool water (always take water samples away from pool filtration return lines to ensure accurate readings). Then simply bring your sample into us as soon as possible, so that we can perform an accurate analysis. For more information on how to look after your pool, please refer to the following three PDF documents. 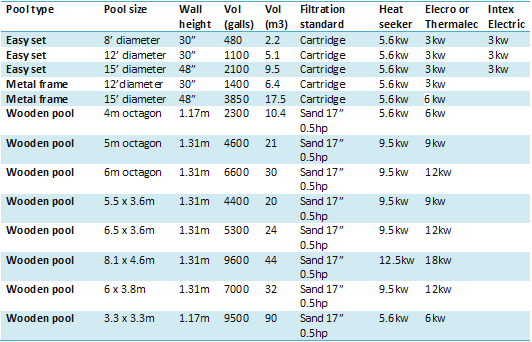 Below you will find recommended plant configurations based on various pool types and sizes. Sizes based on a desired temperature of 29 Degrees Centigrade. Ambient temperature should not be below 15 Degrees Centigrade. 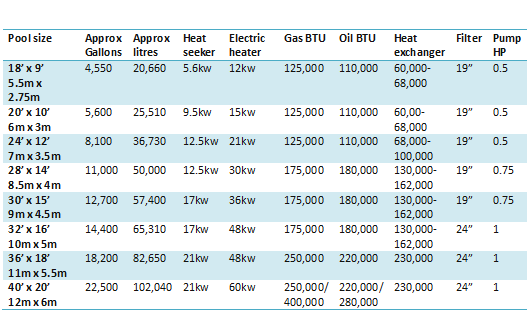 These figures are given on the assumption that a heat retention cover is being used on the pool. Check with your supplier that your power cable and consumer control panel is large enough to take the extra load. Heater should only operate when the filter pump is running. Failure to do this will result in damage being caused to the heater and pipework. The heater should be switched off when backwashing the filter. A pressure or flow switch (standard with Thermalec and Elecro heaters) should be fitted to avoid the heater continuing to operate whilst backwashing. These recommendations should only be used as a general guide; we accept no liability for their accuracy. Check your supply pipe and gas meter are large enough to accommodate the extra gas required. The heater should be switched of when backwashing the filter. A pressure or flow switch should be fitted to avoid the heater continuing to operate whilst backwashing. These recommendations should only be used as a general guide. We accept no liability for their accuracy. If you are experiencing problems with your pool water, then we can help. If you have an above ground pool and the water inside is a dark green colour, you will need to empty it out, jet wash the inside of the pool, and start again. If your pool is a mid-green colour, you might be able to save it, but it would be best to empty it, jet wash the insides, and start again. A mild green is acceptable to save. To maintain healthy pool water, you will need a variety of items. 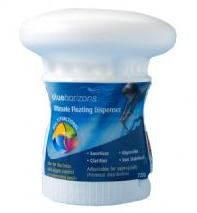 Chlorine Tablets - We recommend the Blue Horizons ultimate floating dispenser 720g, they are simple to use, and will last up to 3-5 weeks. 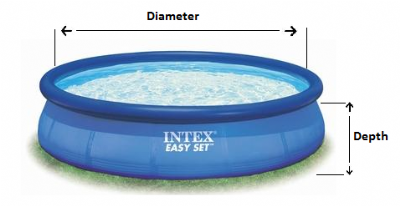 This product is suitable for pools up to 5,000 gallons (22,700 litres). Inside the device is a solid block of chlorine, of which has a built in algaecide and clarifier – this helps keep your pool sparkling clear and helps cut down the amount of chemicals needed to maintain your pool. 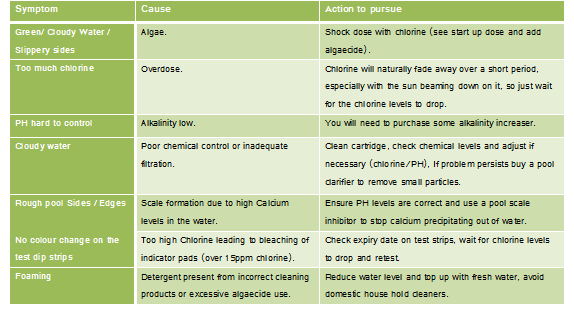 The chlorine levels should be kept between 1-3ppm (parts per million). (For larger pools there is a 1.5kg dispenser available). Shock Chlorine - We recommend the Fi-Clor Superfast Shock Chlorine (shockpot), this is a fantastic product for boosting your chlorine levels up to kill bacteria and help control algae. 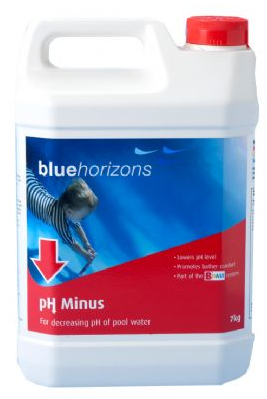 It is currently the most powerful stabiliser-free chlorine currently available in the UK. It can be dosed directly into the pool as it dissolves rapidly. This product can also be used as a regular sanitizer, to help maintain crystal clear water. 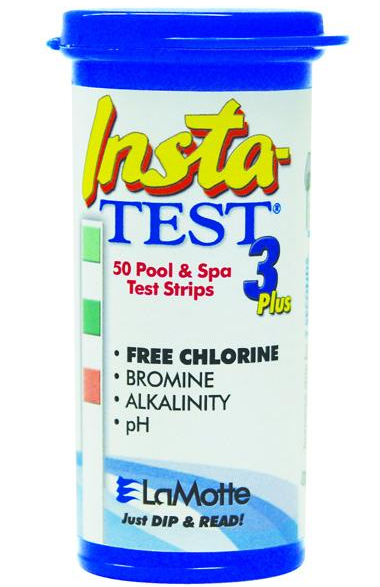 Water Test Kit – We recommend the LaMotte Insta-Test 3 Plus test strips, they come in a pot of 50 and can test for Free Chlorine, Bromine, Alkalinity and PH. Simply take a test strip, dip it into the water, take it out and wait about 20 seconds, then compare the colours from your test strip to those on the side of the pot, it’s that simple. 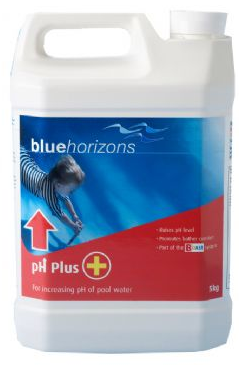 PH Plus – PH Minus – After you have completed a water analysis, it will tell you what your PH levels are, if the PH levels are too high, you will need to purchase some PH minus, if they are too low, you will need to purchase some PH plus. PH is important; it should be tested and corrected at least once a week, PH is the measure of how acid/ alkaline the swimming pool water is. 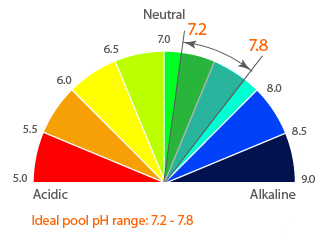 A PH of 7.0 is neutral – below 7.0 is acidic, above 7.0 is alkaline. The PH of our eyes is 7.2, no wonder that the ideal PH for your pool is just that – 7.2, and should be kept within the range of 7.0 - 7.6. Alkalinity – Alkalinity keeps the PH under control and makes sure it doesn’t bounce all over the place (A measure of the ability of the water to resist pH change). The Alkalinity should be kept at around 80-120 ppm (parts per million). In above ground pools (easy set/ metal frame) this isn’t really a necessary product to use, you would just need to be concentrating on the chlorine and PH levels.